Is the Clinton campaign selling woman cards yet? Greeting cards, maybe, or a deck of playing cards with famous women on them. … which was then spotted by Iowa City-based siblings Zach and Zebby Wahls. 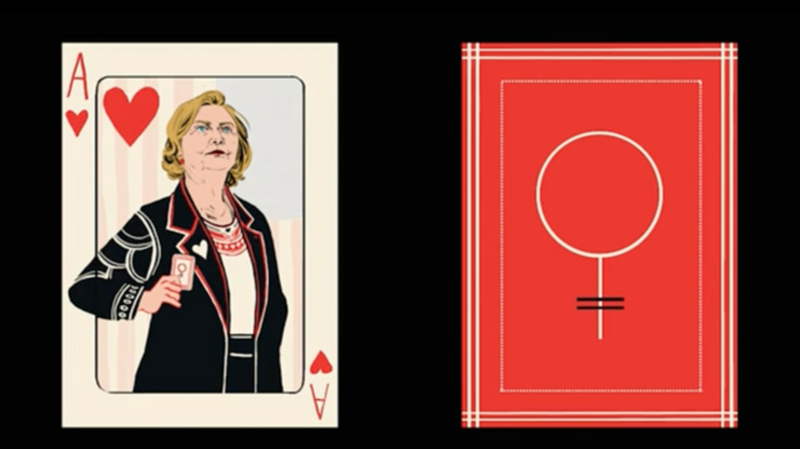 They took that idea and launched a Kickstarter for "The Woman Card[s]," a set of playing cards featuring pioneering women. It was funded in less than five hours, and has now raised nearly $20,000 (its original goal was $5000) with 31 days to go (at the time of writing). The internet moves fast, huh? The cards are sketched by Zebby, who is currently finishing up a Bachelor of Fine Arts degree at the University of Iowa. The first sketch was of course, Clinton (the ace in the deck), followed by the queen, Beyonce. While all the figures have yet to be drawn, the full deck has been selected and includes figures like Supreme Court justice Ruth Bader Ginsburg as the king, along with Clara Barton, Amelia Earhart, Harriet Tubman, Susan B. Anthony and more. While the idea is a fun take on politics, the Wahls write on their Kickstarter page that it “isn't just a novelty,” but a way to honor the achievements of female trailblazers in a variety of fields. While the project is not affiliated with the Clinton campaign, the siblings are supporters of the candidate and a portion of the profit will go to support Hillary for America. The Wahls wrote that Clinton’s people told them that they have something similar in development, so bone up on your favorite two-deck card game and get reading to draw a hand of awesome women from history. The Woman Card[s] will likely be shipped starting in early July (plenty of time before the big election) and you can check them out here.